Nicholas Roerich became famous not only as an artist, but primarily as a philosopher and public figure. He is one of the authors of the esoteric teachings. As a creator, Roerich Sr. embodied in his paintings the history of Russian culture, traditions and spirituality of Russia. Nicholas seriously fond of archaeological excavations, participated in expeditions and excavations. Therefore, the life of ancient, pre-Peter Russia was given to him especially well. The painting “Ilya Muromets” is part of the artistic series “The Bogatyr Frieze”. Once this work decorated the dining room in the house of Bazhenov. Later, the separate panels were removed and moved to the Russian Museum. In addition to “Ilya Muromets,” fragments with images of Mikula Selyaninovich, Sadko, Bayan and Nightingale the Robber have been preserved. 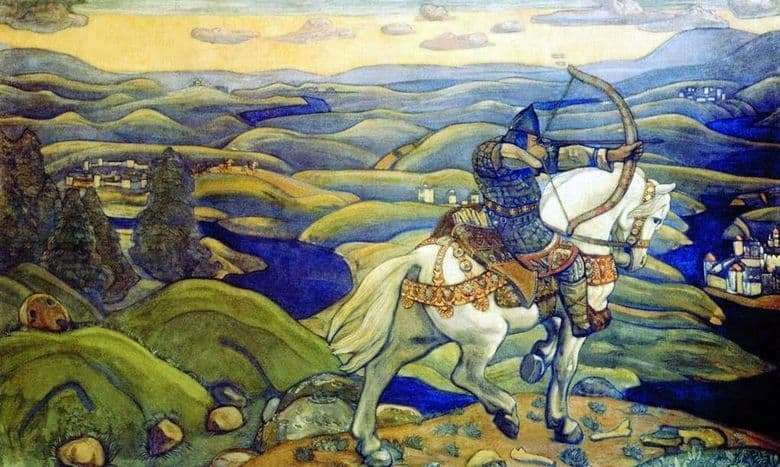 The main character of Russian epics and fairy tales is depicted in the Roerich painting as a strong, strong man in brilliant armor. A homespun shirt with an embroidered ornament peeps out from under the steel chain mail. The rider’s outfit is depicted with scrupulous archaeological accuracy. Riding on horseback, Ilya aims from a bow to someone invisible to the viewer’s eye. The quiver of Murom is full of arrows – as long as the hero is on duty, no one dares to encroach on his native spaces. The warrior’s horse is fully consistent with the owner – just as strong, squat, in a rich harness. The white color of the animal speaks of the bright and pure thoughts of the rider. Ilya Muromets in the picture of Roerich personifies the defender of the motherland, the patriot of his people. To show the connection of the hero with the Russian land, the artist depicted him among the paintings of ancient Russian nature. Fields and forests, rivers and lakes behind the back of a brave warrior are safely protected. In the distance one can see white churches with golden domes – a symbol of the purity of faith. “Ilya Muromets” is one of the most significant paintings in the artist, his kind of “calling card”.